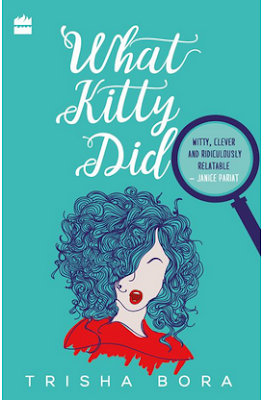 The synopsis of “What Kitty did” reminded me of the movie “Noor”. Portrayed beautifully by Sonakshi Sinha, Noor is a clumsy girl, struggling with weight issues and writing useless pieces at her day job as a journalist until she faces a certain issue that turns her life upside down. I was hoping Kitty would be of a similar character. 120 pages into the book, I was struggling with the story of Kitty. Neither I could empathize with her nor I could relate to her life. There were many references from English literature, which frankly I didn’t have a clue about. So that made it difficult to appreciate their relevance in a specific context. The story has too many drinking sessions followed by vomit and hangovers. Just too many. I wanted to give up reading it any further but I had to persist, given that there was a book review deadline. The key plot - the murder mystery of Roxy Merchant’s death is well etched, with Kitty unraveling the jigsaw puzzle beautifully. This all happens in the second half of the book. This story would have been an interesting read, if it was crisp with one main plot (murder mystery) and 1-2 subplots. But sadly, the first half was so dragging that the interest withered away. The author seems to be in love with Delhi, but for someone who hasn’t lived there, it would be hard to relate to the different places and locations that are explained in detail. “Feeding people, cooking or baking, is a noble profession. Very few of us are actually grateful for the food we get." “It’s odd that I took to baking in the first place. I guess it’s because the order baking demands balances out the complete disorder of my life, in a sweet way"
Not my kind of a fiction novel.